Disneyland has now reached the ripe old age of 57. 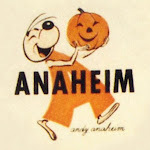 Frankly, in the great scheme of things, 57 isn't really that old, and yet as the years go by, it gets increasingly harder to imagine what the rural town of Anaheim was like before Disney. When news first broke of a permanent "amusement park" coming to town - even one devised by the "Master Showman of the World"-- not everybody living here was enthusiastic. Before Disneyland, amusement parks were widely regarded as dirty, rowdy places and some residents feared that the park could have a negative impact on day-to-day life. lingering concerns by extolling the economic benefits of having Disneyland for a neighbor. 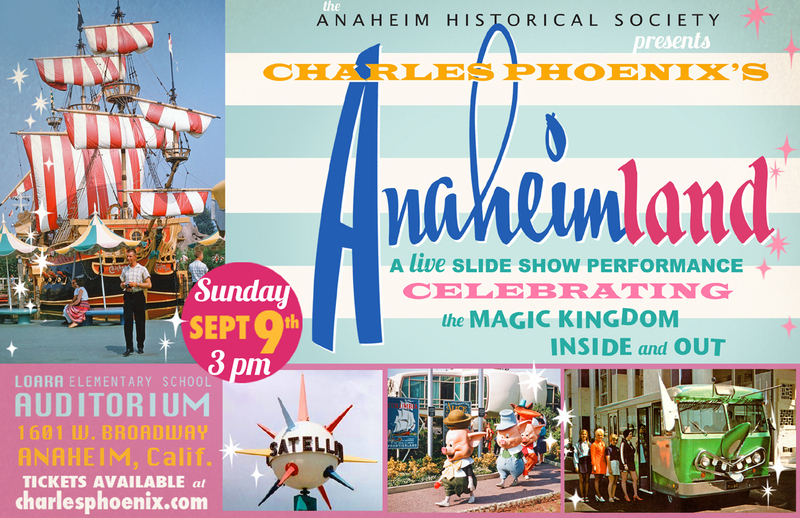 The Anaheim Historical Society will present a live comedy retro slide show performance by pop-culture humorist Charles Phoenix, celebrating Disneyland in the 1950s and '60s, and the legends, landmarks and lore of the city that surrounds it. Live music, special guests, and surprises. If you love Anaheim, you will not want to miss this! Tickets are $25 and available for purchase HERE! Charles is a Southern Californian performer, humorist, chef and author. In his acclaimed live shows, he explores America's classic and kitschy pop cultural past and present, with a unique spin and genuine reverence for all things Americana. Charles has shared his vintage images and culinary creations on TV with Conan and Martha Stewart and is often heard on National Public Radio. Los Angeles Times calls him "the King of Retro," and LA WEEKLY anointed him "Kodachrome King." Click Here to see Charles on The Martha Stewart Show and hear him on NPR and other Public Radio stations.